Application for this workshop is closed. The foundation of Hedi Kyle’s deceptively small and simple book flag book structure is an accordion folded spine. 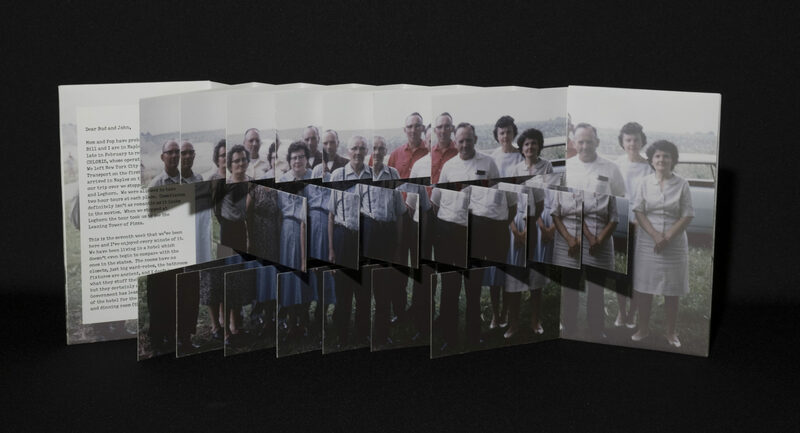 Flaps attached to both sides of each of the spine’s mountain folds allow the artist to fragment and layer a number of complementary or contrasting images and narratives. When the flag book spine is pulled fully open, the fragmented images on the flaps come together to create a large, panoramic image. 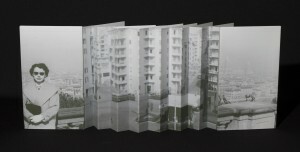 Participants experiment with complementary and contrasting text and images and discuss the effects of different spine and page dimensions, direction of motion, and which images are most successful. Students learn a tidy, non-adhesive method of covering boards and use a jig to facilitate quicker, more precise assembly. While this is not a computer class, digital printing and setting up Photoshop templates for pages, covers and spines is demonstrated. Karen Hanmer’s artists’ books are physical manifestations of personal essays intertwining history, culture, politics, science and technology. She utilizes both traditional and contemporary book structures, and the work is often playful in content or format. Hanmer exhibits widely, and her work is included in collections ranging from Tate Britain and the Library of Congress to UCLA and Graceland. Solo exhibition venues include Florida Atlantic University, University of the West of England Bristol, and the Center for Book Arts (NYC). Curated exhibition venues include the Anchorage Museum of History and Art, Brooklyn Museum, Harvard University’s Fogg Museum of Art, the Kentucky Museum of Art and Craft; and traveling exhibitions sponsored by the Guild of Book Workers (US), Designer Bookbinders (UK) the Canadian Bookbinders and Book Artists’ Guild, and Les Amis de la Reliure d’Art du Canada. Rare Books is proud to support the Book Arts Program with its collections. Hedi Kyle flag book structure. One side of each flag has text, the other side of each flag has a color image which is part of a family photograph. 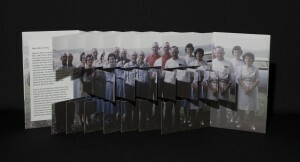 The family photograph becomes whole when the accordion folds are stretched and the pages fall open. Text is from a letter written from Italy in 1954 by a military wife to her relatives. Upper and lower boards are covered in reproduction of a photograph of an American woman [the artist’s mother] on a balcony overlooking Florence, Italy. Issued in an artist-made phase box of green map folder stock with fabric hook-and-loop fasteners.